Just some things you might want to consider. 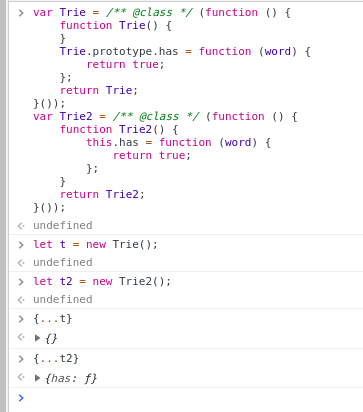 Removed type as it's inferred by it's default value. Some refactor suggestions for #12. Not necessary to have methods as properties using fat arrow. This is not necessary. By default, TypeScript will look in your node modules for all @types/* packages and include them. Thank you so much Nick for taking time proving the great tips, and even doing a PR. I've used it once and forgot about it. Would it be too much for Webpack/Roll up? or should I keep it as arrow methods? Spreading in reducer didn't copy prototype.has. Spread works only on own & enumerable properties. And MDN says propertype is not enumerable. I "might" convert the Trie class as immutable data structure.